In the case of the work Hand the exhibited object, a totally neutral, regular sandstone cube, only represents the demise of a sculpture, or maybe even the potential for a new sculpture. Originally a hand reached out of the stone, stretching its surface as if it was made from some kind of flexible material. This hand was carved back step by step until it totally disappeared, leaving only a cube. 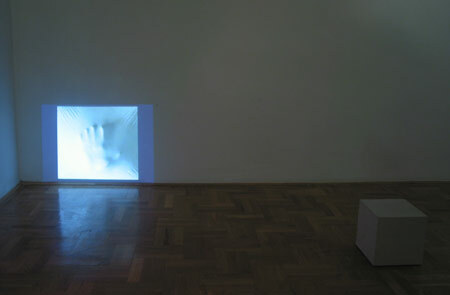 The film made from the pictures of the working phases is played back and forth: the surface of the cube (only a square on the film) is stretched by a hand, and then it falls back into place. This way the viewer is left alone to decide whether the exhibited stone cube is only the remnant of a former sculpture or a potential sculpture or both.